It’s time for what many believe to be the ultimate horror film. Ultimate and Horror are two words that typically don’t belong next to each other and I definitely did not become one of the film’s many fans. I’m guessing that it probably did start a lot of the horror tropes, but it shows that the 80’s feel can’t work for everything. It certainly is better than A Haunting in Connecticut, but I can’t say much else for it. A family moves into a new house and things start to get supernatural. Their chairs seem to move by themselves in the kitchen and they can even defy gravity as something seems to push them. Unfortunately, the disturbances begin to grow more and more violent as the days go by and the family begins to fear for their lives. They are still holding out of course, but then their daughter is kidnapped by these ghosts. The heroes reluctantly call in “The Experts” and now it’s all a matter of finding their daughter before they are destroyed. Well, the plot certainly didn’t help this film’s case. In superhero flicks, I never like when innocent bystanders are dragged into the mess and it’s naturally worse when they are actually hurt. Even worse than that is when a kid is thrown into the mix and that’s what happens here. Like Insidious, the film decides to up the stakes by putting the children in peril and that’s just not a good idea. The little girl is stranded in the demon world for quite a long time and the situation is just way too grim. She doesn’t remember what happened in the demon world so that should keep her psyche from collapsing, but it’s still a fate that should not have happened. A simple way to fix this problem would be to have the main hero be kidnapped. It would be a sad plight for him, but one that isn’t quite as bad since we know that he can fight. That being said, kidnappings are simply not the best plot device to use, but they can work if used effectively. The film just didn’t do this and they were trying a little too hard for an emotional feeling. Because of that, the main characters are feeling pretty gloomy for most of the film. There are no big speeches or heroic comments to be found for quite a while. The experts who come in to help are naturally not that good. Then they call in the ultimate expert and she rubbed me the wrong way from the start. Her first big statement to the heroes is basically “You have to promise to do whatever I say even if it goes against your beliefs as a Christian!” “Lol no” is what I would have responded and they should have told her to skip the intro. Instead, they instantly agree and of course they do want her on their side, but she definitely seemed like a pretty terrible character right then and there. She never went back up for me from there and some of her actions just didn’t make sense. “Go to the light…go away from the light…back to the light” insert and repeat many times. She was better than the former leader of the experts though. That lady decided to talk with the main heroes for way too long. It was the one part of the film that definitely dragged on a lot as you would wait for her to finish. Her two underlings weren’t great even if one of them was pretty confident. They let their mind wander far too often and they act like this is some kind of hobby for them instead of something that they take seriously. I don’t blame one of the underlings for running out of the house though since things were definitely getting pretty dangerous. Naturally, I’m sure that we all remember the rating controversy from back in the day. After seeing the film, I can definitely say that the MPAA was correct in their initial response of an R rating. Since there was no PG 13 at the time, it was definitely the right move since this is much closer to R than PG. Spielberg and the others got them to bring it down to a PG later, but it’s one of those changes that I definitely don’t disagree with. The film is surprisingly intense for an 80’s film and it can feel like Alien at times. I definitely wouldn’t say that the film is scary, but it compensates with violence and the gross factor. One guy’s face literally starts to peel away and it’s easily one of the worst scenes in the film. Another scene shows a piece of meat getting torn apart, but with extra effects to make it seem more like human meat if it was being ripped apart. Those two scenes alone make it unsuitable for PG. We also get to see how the humans look once they are spit out of the demon world and while it looks like jelly you can also easily mistake it for more violence. The ambiguous work makes you wonder if the effects just didn’t age well or if you’re misinterpreting it. Either way, it was definitely pretty gross. The film also brings back the horror trope that I had actually manages to avoid for a while. The main heroine bath scene. You’ll feel like sighing when you see her turn on the faucet because you know that this scene was clearly not needed. There is literally no point as no ghost appears to attack her at all. It’s simply a very long, boring scene of her taking a bath. That’s another big shot against the film and we definitely did not need any more at this point! Let’s quickly look at some of the positives. The ghosts are actually pretty tough and they do get designs. There’s a 4 legged creature that looks like Clover and he seems to be the main villain. His physical strength is underwhelming, but the design is what counts and he may have some kind of electrical ability at his disposal. The enemies can possess objects so they turn one of the clowns into a weapon of mass destruction. It still only has the strength of a toy though so it’s easy to overpower, but it’s great as a distraction. The tree scene was definitely one of the more intense ones since it really comes out of nowhere. At that point, you weren’t really expecting anything quite like that so it definitely popped out. The various monsters definitely added some action to the title. The bystanders who are around can definitely raise a few questions though since nobody seems to really do anything. The neighbors notice that the spirits are messing with the heroes and they decide not to help. The house starts to explode along with the neighborhood and the onlookers only appear to be shocked. Some of them have enough energy to start running, but they all felt pretty hollow. This was more of a personal problem for the family though so I guess it’s all right. It’s not a huge idea. All right, let’s quickly go back to the negatives. The film performs quite poorly when it comes to the animal life. A bird dies in one of the opening scenes and that should have been cut out. The main girl then buys two gold fish even though we know that they probably won’t survive the house exploding. The dog lives and I’m glad about that, but the film shouldn’t have introduced the other animals. It doesn’t serve a purpose and it feels like the film is just trying to get under your skin with how gritty it is instead of trying to be a quality film. The main characters aren’t bad, but they’re not very m memorable either. The main guy seems to overreact with the boss considering that the guy seems to have been amiable to him in the past. Their teenage daughter isn’t that good though as she really overreacts with the neighborhood is hit and she almost jeapordizes their chances of escape. The other two kids are all right and don’t get a lot of character either way since they’re too young. One scene that will probably make you wince is when the main characters decide to go talk to their neighbor. They can barely talk because they’re laughing so much and it’s sad for them. I just figured that the ghosts were keeping them from talking, but their dialogue afterwards confirms that this simply isn’t the case. That just makes you wonder and while they were naturally embarassed, it was just too much of an overreaction on their part. The best part of the film is easily at the beginning when the heroes are trying to watch a football game. The only problem is that they get the same feed as their next door neighbor so they quickly fight with the remote. A whole film could easily be made out of that concept and I have a feeling that it would be more fun. If the whole film was like that, I definitely would have had a blast with it. There isn’t a twist ending this time, but we still do get one last climax after the film seems to have ended. I suppose that will have to do and we deserve a happy ending for the protagonists once in a while right? It works as a change of pace and we see that the ghosts definitely don’t go down without a fight. They tricked one of the “experts” so I give them kudos for that. 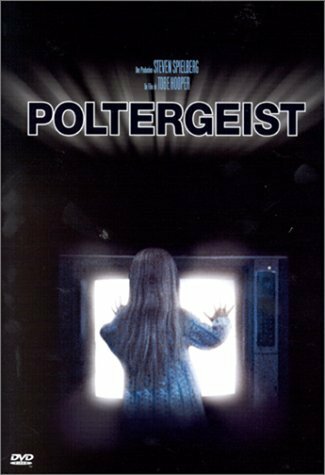 Overall, Poltergeist is not the ultimate horror film and I’d say that it’s not even a good one. Relatively speaking, it probably holds its own to most of the other horror films, but I didn’t dig it. The main reason is that everything’s happening to a little kid and the film just has too many gross scenes. The fanservice doesn’t help either and the film will definitely need to rethink a lot of its areas before trying to give us another big film. The scenery is good and you’ll like the son’s room, but the film tends to fall apart after that. If you want to see a film that’s nice and scary while still keeping it real, check out Scooby Doo Zombie Island! This entry was posted in Live Action Movie Reviews, Live Action Movies, Reviews and tagged Film Review, Ghosts, Horror, Horror Film, Movie Review, Poltergeist, Review, Steven Spielberg by dreager1. Bookmark the permalink.